A government shutdown in the US happens when Congress fails to pass appropriations legislation to fund the federal government agencies and operations. A government shutdown can also occur if the US President refuses to sign the appropriations legislation. Congress must approve a federal budget for the upcoming fiscal year by a certain date. If Congressmen and Congresswomen (lawmakers) don’t approve a federal budget by that date, there will be no more money to finance government operations. So, there is a government shutdown. If there is no money to run something, it has to shut down. When there is a government shutdown in the US, however, not everything stops. A government shutdown doesn’t mean that every operation of the federal government stops working. Only the ones that lawmakers deem as ‘non-essential’ close down temporarily. The authorities ‘furlough‘ civil servants (federal workers) who work in non-essential parts of the federal government. Dictionaries say that to furlough means to grant a worker a leave of absence. That is a nice way of saying ‘to lay off‘ a worker. In other words, the civil servant does not work and gets no income. If the government furloughs you, it means they have sent you home without pay. However, when you start work again, the government will pay you retroactively for the pay that it had docked. What shuts down during a government shutdown? This Commission operates twenty-four cemeteries for American servicemen and servicewomen killed abroad. All the cemeteries are overseas. All Congress lawmakers receive their salaries during a government shutdown, as does the President. Federal employees say that it is ironic that the ones with secure jobs and salaries during a shutdown – lawmakers – get to decide on all other federal employee’s jobs and incomes. 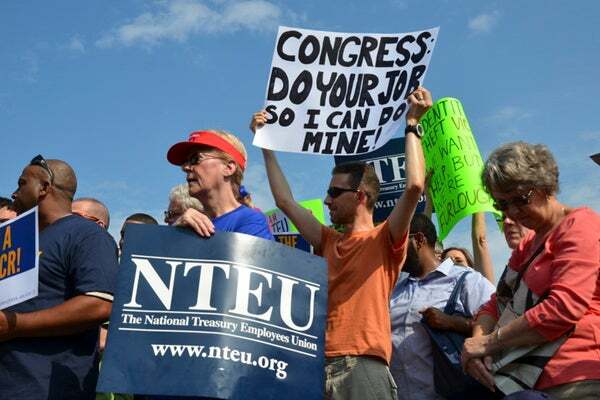 Congress lawmakers get to decide what happens to the federal employees who work in the Capitol (Congress building). In other words, they decide who is furloughed and who continues working during a shutdown. The offices that issue statistical and economic reports, on the other hand, close down. Even the offices that supply price and supply level data of agricultural goods are closed. For those who work in the commodities markets, these reports are extremely important. When, in 2013, there was a government shutdown, 40,234 of the Commerce Department’s 46,420 employees were furloughed. If you have no savings, what good is being told you will eventually get your money if you urgently need it now? During the 2013 shutdown, 3,983 of the Education Department’s 4,225 workers were sent home without pay (furloughed). The authorities continued paying student loans and Pell Grants. However, many recipients experienced delays. In 2013, HHS furloughed 52% of its employees. Even the Centers for Disease Control and Prevention, an ‘essential’ service, could not conduct in-depth investigations. In some cases, these were investigations attempting to identify the causes of outbreaks that had been occurring in several states simultaneously. The FDA furloughed 45% of its 14,779 workers. FDA stands for the Food and Drug Administration. It is the country’s regulatory agency in charge of food, medications, medical devices, tobacco products, and cosmetics. Approximately 86% of this Department’s 231,000 workers continued working during the 2013 government shutdown. Eighty-five percent of Justice Department workers continued working during the 2013 shutdown. Law enforcement personnel continued working. Work on civil litigation, on the other hand, stopped. Approximately 70% of the country’s immigration courts, including judges, were furloughed. The Labor Department continued to pay workers’ compensation claims and unemployment insurance during the 2013 shutdown. The Labor Department furloughed 82% of its 16,304 employees. If the President, Congressmen, and Congresswomen had their pay docked during government shutdowns, would there have been fewer of them since 1976? Workers in the Department of Veterans Affairs, the Environmental Protection Agency, the Federal Communications Commission, the General Services Administration, and the Intelligence Agencies furloughed hundreds of thousands of workers. The Library of Congress, many other libraries, national parks, and museums closed their doors during the 2013 shutdown. Government shutdown – an American thing? In all the other advanced economies, government shutdowns do not happen. In the United Kingdom, for example, the party in power would have to call a general election if it could not get approval for its budget. Not getting parliament to approve the budget is the equivalent of a no confidence vote. The electorate would punish the party in power. The government shutdown is very much an American thing.